Penguin Run, Cartoon. Image supplied by Universal Games and used with permission. There are all kinds of addictive free game apps out there competing for our time these days. Card games, match three games or puzzle games for starters. And then there are tapping games. From Angry Birds to Flappy Bird, touch screen devices were made for tapping games involving birds or animals. One of the newest is Penguin Run, Cartoon>, a fun Antarctic game from Universal Games, available on Android. Usually I am worse than useless at these kinds of free games, so it’s a good thing they’re free because I hate wasting money. However Penguin Run, Cartoon is one of the simplest tapping games I’ve come across. It’s a vertical scrolling game with a central pipe. Your little chibi penguin character hops from one side of the pipe to the other as you tap to avoid the snow piles (or are they ice spikes? I’m not sure) and catch fish. Both fish and piles appear randomly on either side and at different speeds so it is a real game of skill. Apparently, later on in the game, the little pokemon-style bird has to dodge snowballs too, but despite several days’ concentrated playing, I have yet to confirm this. Points are awarded for snow piles avoided and fish caught. Your anime starts off in the standard penguin colours of black and white but once you have caught 30 fish you can upgrade your penguin to any of a dozen different colours. This can be achieved by tapping the penguin icon to the bottom left of the screen and scrolling through the choices. 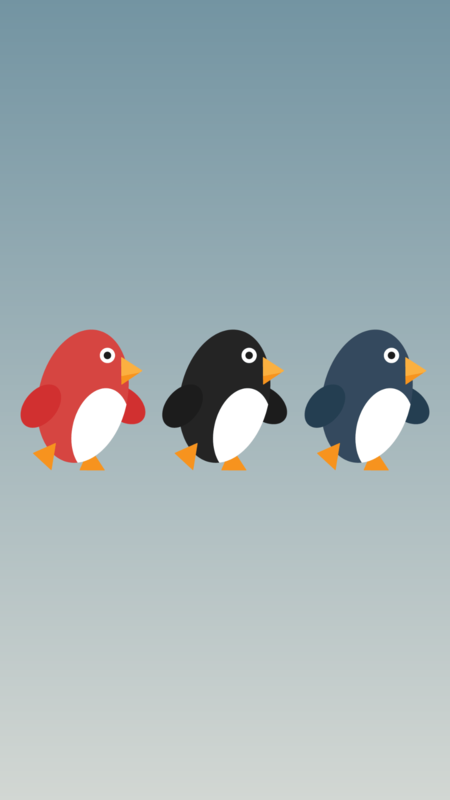 30 fish will be deducted when you change the penguin’s colour. The middle icon shows the leader board of those players logged in through Google. The highest score at present is 77, which will take some beating, I think, at least by me. There is music to the game, with background music plus a sound every time the penguin jumps, catches a fish or lands on a snow pile. In line with the simple nature of the game, the sounds are all cartoonish in nature, with the one announcing that the bird has collided with a snow pile sounding a lot like a raspberry. Flappy Penguin Run, Cartoon. Image supplied by Universal Games and used with permission. This speed game is easy to learn and difficult to put down. Even the advertisements inherent in any free game don’t prove too much of a distraction. The graphics are high quality, with the bright penguin (once you’ve adjusted his colour) contrasting with the greens, pale greys, whites and blues of the background. This game would appeal to all ages although it seems to be aimed at young girls in particular. On a tablet, with a bigger screen, I can see it being used as a therapy tool for people who need to retain or regain mobility in their fingers. It would also be useful as part of a mental occupational therapy or brain training regime, because it requires concentration even if it is simple to play. I’m a big fan of casual games, and find myself rather easily distracted by them, although they are a really good way to while away a journey where the signal strength isn’t that good. Something addictive like Penguin Run, Cartoon is right up my street for a slow bus ride home from a tiring day at work. It would equally keep your younger family members quiet in the back of the car on a long journey too, mind.